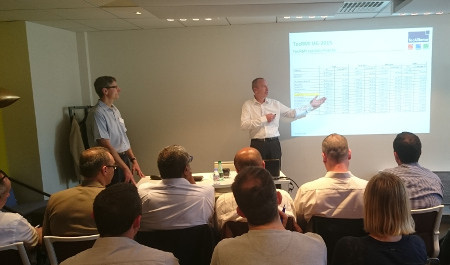 For the second time, TecAlliance has held User Group Meetings for TecRMI users from France and Italy. About 35 participants attended the meetings in Milan on 10 June 2015 and Paris on 11 June 2015. This time around the presentation of results from a benchmark study sparked particularly keen interest: a consulting firm hired by TecAlliance analysed the services offered by six passenger car service providers. Repair and maintenance specialist TecRMI was selected as the benchmark for passenger car repair shop systems. Ralf Pelkmann, Vice President of Information Management at TecRMI, is more than pleased with the success of the events: “TecRMI users in Italy and France have taken very well to the TecRMI User Group as a ‘from the industry for the industry’ platform for communication. For us, these events provide a great opportunity to become better acquainted with the needs and wants of TecRMI data users in various markets. The input from participants represents a vital contribution to the continuous optimisation of our industry solution,” said Pelkmann. The TecRMI User Group Meetings are held regularly in different countries in Europe. The goal of the events is to bring TecRMI data users together to keep them abreast of the latest developments at TecRMI and sit together with them to discuss the needs of the market. The current timetable will be announced on the TecRMI website.